6am - It seems that our fridge, Mister Dometic, is having a hard time keeping cool while Scampy is heading down the road. This morning Mister Dometic has an 8am appointment at RV Specialists, in San Diego. Only thing is, George wrote down "RV Trailer!" instead of RV Specialists. When we Googled for directions for RV Trailer, we traveled in the wrong direction! Good thing we started our trip at 6am. When we figured out the mistake, MsScampy had to travel in heavy traffic. Everything turned out OK though. We arrived at 7:45am, 15 minutes before Scampy's 8am appointment. 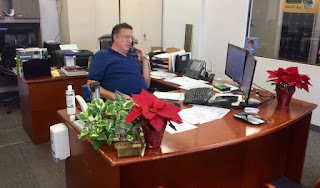 On walking in to the RV Specialists' office, the guy behind the desk looked very familiar. Mark: I'm Mark Cooley. Who are you? George: I'm your 8am appointment. I know you from the olden days. But your shop was a whole lot smaller then. And in a different location. Mark and I schmoozed around for awhile talking about the "used to be stuff back when." Then Mark set Scampy up with Ray, his "best mechanic!" I watched as Ray began to work. "What's wrong with the Dometic?" he asked. I told Ray, "The burner blows out when we're driving." Ray explained that this model Dometic fridge does not have an, "automatic re-light" system. You can't run it on propane when traveling. Because the wind will blow the flame out. When moving, run it on 12 volts." Mark has been in the RV repair business for 40 years! You might have met him yourself. I put Mark's pic up on the Blog as an historical thing. If you know him, let me know? AlaskaUSA Credit Union in Apple Valley CA where I am living now. North Island Credit Union in La Mesa CA where I used to live. I arranged with AlaskaUSA in Apple Valley CA to over nite a check to North Island in La Mesa CA. But AlaskaUSA sent via UPS that check to my Lone Wolf Colony address in Apple Valley CA. Which is my current home. UPS caught the error, and needs AlaskaUSA to contact UPS with a corrected address [The North Island address]. AlaskaUSA while talking to me on the phone indicated that I myself am responsible for this mistake!! This is NOT correct! I entered the correct address, as shown in Alaska's online data. It seems that working people today have no clue how to think on their own. They are mostly just sheep, preaching the company line. When I spoke with a first line person on the phone. I did NOT get: "Oh, I am so sorry. We will straighten this matter out!" When I got transferred to a supervisor. Same thing! No apology. Just explanations about working with their data processing to resolve the mis-addressed check issue. I explained to that supervisor, that I am not interested in how AlaskaUSA goofed up. All that I want to know is when will my check be deposited in my North Island account? Please G-d. Help me with these ignoramuses. PS: I was on the phone with AlaskaUSA for over an hour. And I still do not have a clue what they will do in this matter. On New Years Eve, during the nitetime, it got real cold inside Scampy. Our Wave3 heater had gone off! This is extremely unusual. I never had an Olympian Catalytic Heater go bad. And I used them for over 12 years. It had to be that the propane tank was empty. But if that was the case, then our propane tank went from almost full to dead empty in only a few hours. I checked the propane tank connection. Sure enough, it was loose. Since it was New Years Eve, I was sooooo lucky to find an open gas station that sold propane. What was wrong with the propane tank connection? On inspection, I found what was wrong. There was NO slack in the hose to the tank. Somehow the tank had rotated slightly. This rotation put pressure on the hose connector to the tank. This allowed the connector to leak! To rotate the tank to its proper position, a ratchet wrench with a socket of the right size was required. Also, an extension for the socket. Today for about $27 bucks, a socket set was purchased at Home Depot. That did the trick! Now the propane tank's hose has a gentle loop. I swear that people are getting dumber every day ! I like my Wells Fargo online banking account since 1998. Can do everything on my iPhone. When you phone Wells Fargo, does a robot machine answer your call? If your answer is "Yes", then in my opinion, Wells Fargo has absolutely no regard for you as a customer. If they did have regard for you, a human would answer each phone call that you make to Wells Fargo. One thing that really pisses me off, is when the robot machine voice says, "Sorry for your long wait. We really appreciate you as a customer." Do customers actually believe that a robot, non-thinking, non-human entity really is sorry? I believe that they do. Shows what a sorry state is the current crop of humans. I ruined a trailer battery years ago trying to run my refrig on 12 v while traveling even though the truck was supplying power to the trailer. The appliance took more than the truck could resupply during the towing time. My refrig at that time drew 34 amps for the heating element. Did you have a huge refrigerator? A typical 16-cubic-foot, frost-free refrigerator draws 6 amps of electricity and uses 750 watts. I checked my Dometic with an Amp Meter. It is 10.3 amps. Multiple banks, multiple credit cards, multiple brokers = multiple problems. We have one bank, one credit card and one investment broker. Life is so simple that way. What was the reason for your making this comment? I sure would love to know. Its always the computer systems fault these days. I dare to say this generation could not make it with paper and pencil.